The many proposals advanced by policymakers and designers to tackle the ever more complex issue of mobility are merely spurious solutions, according to design critic John Thackara. We must radically change our thinking in this regard. In his view, we can learn a lot from the workings of the human brain, microprocessors and network topography. ‘The Wonder City You May Live to See. 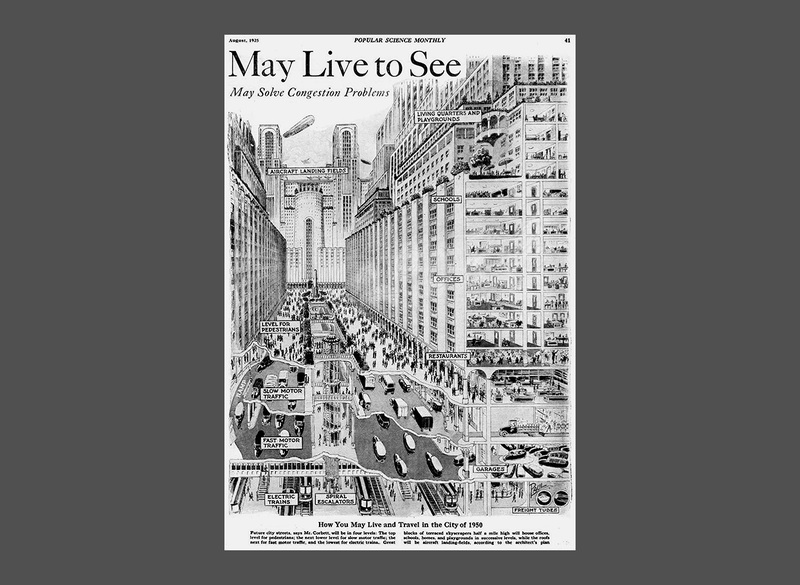 Buildings Half-Mile High and 4-deck Streets May Solve Congestion Problems’, Popular Science Monthly, 1925. Gram junkies are those fanatical hikers and climbers who fret about every gram of weight that might be carried – from titanium cook pans to toothbrush covers. Reading their online forums you discover that excess weight is not just a performance issue for these fanatics: they take excess weight personally. In the matter of sustainable mobility, we all need to become gram junkies. Modern mobility doesn’t just damage the biosphere, our only home. Global systems of air, rail and road travel are also greedy in their use of space, matter, energy and land. Economic structures perpetuate the problem. Few laws or tax regimes take account of these hidden costs. Sustainable mobility is more about changes to economic structures and cultural perceptions than about the development of exotic power sources for vehicles. The hardest design challenge is the complexity of ‘transport’ and mobility as a policy or design issue. Many transportation interventions help solve one or two problems – but exacerbate others. The best-known example of such a rebound effect is the way that the expansion of highways reduces congestion for a time – but tends to increase total vehicle traffic. Another rebound effect is economic: increased vehicle fuel efficiency conserves energy, but because it reduces vehicle operating costs, it tends to increase total vehicle travel. These negative on-costs are compounded through time. The growth of the us Interstate Highway System, for example, changed fundamental relationships between time, cost and space. We spend the same amount of time travelling today as we did 50 years ago – but we use that time to travel longer distances. The average German citizen today drives 15,000 km a year; in 1950 she covered just 2,000. A lot of our travel time these days is commuting and work-related travel which we believe we cannot avoid – but which we simply did not do 50 years ago, We also spend a lot of time travelling in order to shop and to take the kids to distant schools – ‘essential’ journeys that did not exist a generation or two ago. These new patterns of use of space and time, which have been enabled by car ownership, have stimulated the growth, in turn, of a gigantic worldwide ecology of mutually dependent economic actors. It is not in the interest of these actors to reduce transport intensity; on the contrary, their economic survival depends on its perpetual growth. Unsustainable transport is not, for the most part, the result of bad behaviour such as laziness. It’s the result of human beings responding to economic stimuli. Todd Litman, who runs the Victoria Transport Policy Institute in Canada, explains one way in which simple tax arrangements amplify transport intensity. To a car owner, for example, depreciation, insurance, registration and residential parking are largely fixed costs – they are not directly affected by how much a vehicle is driven. Motorists therefore have an incentive to maximize their vehicle travel to get their money’s worth from such expenditures. They receive no incentives to drive less. Litman describes these market distortions as ‘economic traps’ in which competition for resources creates conflicts between individual interests and the common good. Most insidious of all: the impacts of these economic traps are ‘cumulative and synergistic: total impacts are greater than the sum of individual impacts’, as Litman puts it. Seemingly innocuous fiscal distortions skew countless travel decisions and contribute to a long-term cycle of automobile dependency. The damaging impacts of modern mobility on the biosphere tend to be indirect and hard to perceive. Curiously, the same goes for its impact on human bodies. Cars kill people too – but without causing much of a fuss. An average of 3,242 people die on the roads each day around the world1 – a number similar to the total deaths in the 9-11 attacks. Children are especially vulnerable: traffic accident deaths account for 41 per cent of all child deaths by injury. But the carnage caused among children by cars barely registers on the public imagination. The threat of ‘terrorism’, on the other hand, has driven the growth of ‘homeland security’ as a new global industry. A dazzling array of solutions is being considered to deal with these complex challenges. The website Newmobility.org, for example, has identified 177 different projects and approaches to sustainable mobility.5 These range from bus rapid transit (brt), car-free days and demand-responsive transport (drt) to hitchhiking, pedestrianization, smart parking strategies and vanpooling. The trouble is that every solution that assumes our present or increased levels of transport intensity turns out, on closer inspection, not to be viable. Investments in high-speed trains such as the tgv are another non-solution. Europeans believe that high-speed trains are far more environmentally friendly than aircraft – but they’re not.7 When researchers at Martin Luther University studied the construction, use and disposal of high-speed rail infrastructure, they found that it takes 48 kg of solid primary resources for one passenger to travel 100 km by Germany’s high-speed train. Electric cars are the biggest distraction of all. The assumption in European and us policy is that smart grids powered by renewable energy will power millions of electric or hybrid vehicles.9 Unfortunately, these technology-driven solutions are not viable once the economics of electrical grid modernization, and sheer time, are factored in. The German branch of the World Wildlife Fund (wwf) published a study in May 2009 (conducted with izes, a German institute for future energy systems) – electric cars reduce greenhouse gases only marginally, they found.10 The manufacturing processes of both the hybrid and the fully electric car require more energy than those of any conventional petrol-powered car. A worst-case (and frankly most likely) scenario is that most electric cars will run on electricity from coal rather than from renewable sources. We once hoped that the Internet would replace trips to the mall, that air travel would give way to teleconferencing and that digital transmission would replace the physical delivery of books and videos. In the event, technology has indeed enabled some of these new kinds of mobility – but in addition to, not as replacements for, the old kinds. In the same way that roads built to relieve congestion have increased total traffic, the Internet has increased physical transport intensity in the economy as a whole. Rhetorics of a ‘weightless’ economy, the ‘death of distance’ and the ‘displacement of matter by mind’ sound ridiculous, in retrospect. Rather than tinker with symptoms – such as inventing hydrogen-powered vehicles, or turning petrol stations into battery stations – the more interesting and pertinent design task is to rethink the way we use time and space and to reduce the movement of matter – whether goods or people – by changing the word ‘faster’ to ‘closer’. Our transportation challenge can be compared to distributed computing. The speed-obsessed computer world, in which network designers rail against delays measured in milliseconds, is years ahead of the rest of us in rethinking space-time issues. It can teach us how to rethink relationships between place and time in the real world, too. Embedded on microchips, computer operations entail a precise accounting for the speed of light. The problem geeks constantly struggle with is called latency – the delay caused by the time it takes for a remote request to be serviced or for a message to travel between two processing nodes. Another key word, attenuation, describes the loss of transmitted signal strength as a result of interference – a weakening of the signal as it travels farther from its source – much as the taste of strawberries grown in Spain weakens as they are trucked to faraway places. The brick walls of latency and attenuation have led computer designers to speak of a ‘light-speed crisis’ in microprocessor design. The clever design solution to the light-speed crisis is to move processors closer to the data – in ecological terms, to relocalize the economy. Network designers, striving to reduce geodesic distance, have developed the so-called storewidth paradigm or ‘cache and carry’. They focus on copying, replicating and storing web pages as close as possible to their final destination, at content access points. Thus, if you go online to retrieve a large software update from a file library, you are often given a choice of countries from which to download it. This technique is called ‘load balancing’ – even though the loads in question, packets of information, don’t actually weigh anything in real-world terms. Cache-and-carry companies maintain tens of thousands of such caches around the world. By monitoring demand for each item downloaded, and making more copies available in its caches when demand rises and fewer when demand falls, operators help to smooth out huge fluctuations in traffic. Other companies combine the cache-and-carry approach with smart file sharing or ‘portable shared memory parallel programming’. Users’ own computers, anywhere on the Internet, are used as shared memory systems so that recently accessed content can be delivered quickly when needed to other users nearby on the network. My favourite example of decentralized production concerns drinks. The weight of beer and other drinks, especially mineral water, trucked from one rich nation to another is a large component of the freight flood that threatens to overwhelm us. But first Coca-Cola and now a boom in microbreweries demonstrate a radically lighter approach: export the recipe, and sometimes the production equipment, but source raw material and distribute locally. People and information want to be closer. When planning where to put capacity, network designers are guided by the law of locality. This law states that network traffic is at least 80 per cent local, 95 per cent continental and only 5 per cent intercontinental. Communication network designers use another rule we can learn from in the analogue world: ‘The less the space, the more the room.’ In silicon, the trade-off between speed and heat generated improves dramatically as size diminishes: small transistors run faster, cooler and cheaper. Hence the development of the so-called processor-in-memory (pim) – an integrated circuit that contains both memory and logic on the same chip. So, too, in the analogue world: radically decentralized architectures of production and distribution can radically reduce the material costs of production. We need to build systems that take advantage of the power of networks – but that do so in ways that optimize ‘localness’. Nowhere is this design principle – ‘the less the space, the more the room’ – better demonstrated than in the human brain. The brain, in Edward O. Wilson’s words, is ‘like 100 billion squids linked together’ – an intricately wired system of nerve cells, each a few millionths of a metre wide, connected to other nerve cells by hundreds of thousands of endings. Information transfer in brains is improved when neuron circuits filling specialized functions are placed together in clusters. Neurobiologists have discovered an extraordinary array of such functions: sensory relay stations, integrative centres, memory modules and emotional control centres, to name a few. The ideal brain case is spherical, or close to it, Wilson observes, because a sphere has the smallest surface relative to volume of any geometric form. A sphere also allows more circuits to be placed close together; the average length of circuits can thus be minimized, which raises the speed of transmission while lowering the energy cost for their construction and maintenance. The mobility dilemma is not as hard as it looks. I have tried here to look at the issue through a fresh lens and to borrow from other domains, such as microprocessor design, network topography and the geodesy of the human brain. The biosphere itself is the result of 3.8 billion years of iterative, trial-and-error design – so we can safely assume it’s an optimized solution. As Janine Benyus explains in her wonderful book Biomimicry, biological communities, by and large, are localized or relatively closely connected in time and space.15 Their energy flux is low; distances covered are proximate. With the exception of a few high-flying species, in other words, ‘nature does not commute to work’. 15. Janine Benyus, Biomimicry: Innovation Inspired by Nature (New York: Perennial (HarperCollins), 1998). John Thackara is a writer, educator and design producer. He is the author of In the Bubble: Designing in a Complex World (2005) and of a widely-read blog at www.designobserver.com.